Average life expectancy has been changing, with steady increases that are not expected to diminish. 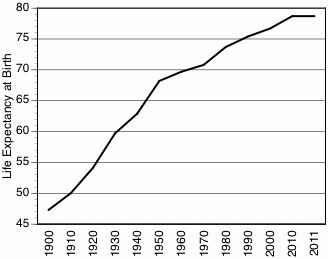 The chart below shows what has been a steady rate of improvement, with a change in trend in 1950 where the gains from improved sanitation (e.g. potable water and sewers) started making a transition to anti-bacterial and virus inhibition measures. It appears that the current pause in longevity growth places the health of the population on the adoption of measures that ameliorate conditions caused by diseases of genetic origin. The rise in life expectancy from 1900 through 1950 was the result of improved sanitation as in the supply of drinking water and sewage disposal. Clearly it was the sanitation engineer show made the greatest contribution to improved health. After 1950 the medical profession, with enhanced drugs for the treatment of infectious diseases, made a remarkable impact on life expectancy. CONCLUSION: We are now on the verge in the next revolution in bringing about the extension of human longevity. It will be the treatment of disease of genetic origin, such as cancer and diabetes. These will be targets of the next generation of medical treatment. With such improvements one can expect life expectancy to rise to over 90 years.